Saturday we woke up to GORGEOUS weather and excited to meet our beautiful couple Ed & Taylor! Usually we do engagement sessions with our couples before the wedding to get to know them. However due to schedules and the fact they live in Charleston SC, we unfortunately did not get to meet them until the wedding day! I will be honest I was a little apprehensive going into unknown territory! However, these two couldn’t get anymore down to earth and sweet! They were totally approachable and oh so happy!!! I absolutely adored watching this couple tie the knot at The James River Baptist Church in Williamsburg. It is such a cute little church that was perfect for their ceremony. We then headed to the William & Mary Alumni House. They had a beautiful reception space set up. Very classy and adorned with white flowers and magnolia leaves throughout. 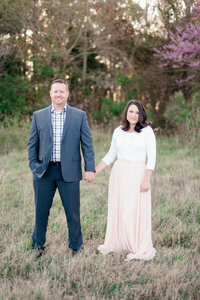 The essence was truly a Southern Wedding! I also loved the bridesmaids navy dresses and I cannot get enough of Taylor’s bouquet. It was absolutely perfect! Thank-You to the newlyweds for trusting Luke & I for your wedding day. You both are such a beautiful couple and Luke & I wish you a lifetime of happiness! Sharing our favorites and if you scroll down you can see all the incredible vendors that made their day flawless! When I grow up I want to be like Taylor’s Grandma… She is so young at heart! I am OBSESSED with Cathedral Veils. Thank-You Taylor for letting me play in your veil! We actually have some Behind The Scenes shots of these!